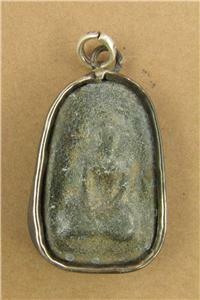 Home › Pendants › Small Thai Buddha pendant. Brown clay. Sitting buddha. Silver hoop. 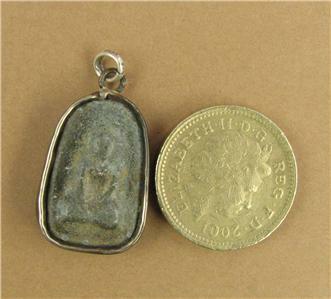 Small Thai Buddha pendant. Brown clay. Sitting buddha. Silver hoop. 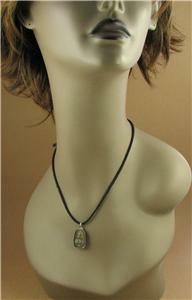 This is a clay Buddha pendant, set in metal with a fine silver hoop.. 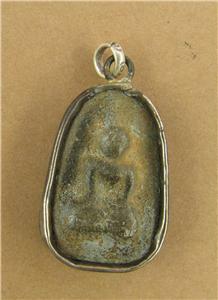 The pendant is double-sided and has a sitting Buddha on both sides, each has a slightly different posture. The Buddha has been made by the monks in the Buddhist monasteries in Thailand. The clay used is from the grounds of the monastery where the monks practise their walking meditation. After being formed it is baked, so it becomes very hard. From the appearance of the pendant I think it might be a used one, but as I don't speak Thai, and bought it from a Thai lady in a market, I can't be sure. 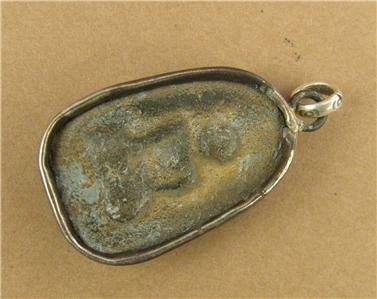 For the same reason I'm also not sure what the metal is surrounding the pendant. The hoop at the top has been added by me, and is solid fine silver. 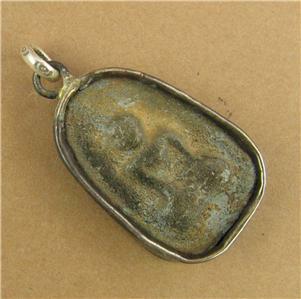 I will send the pendant on an adjustable length of sturdy cotton cord. The silver hoop at the top of the pendant can be opened and reclosed over a silver chain, if you would prefer to use a silver chain. 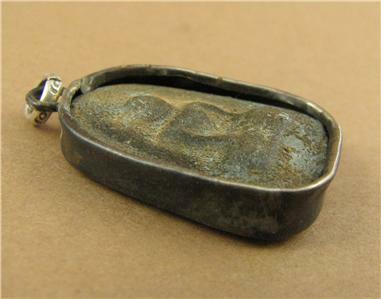 From the top of the hoop, the pendant is 3 cm long, and 1.5 cm across.